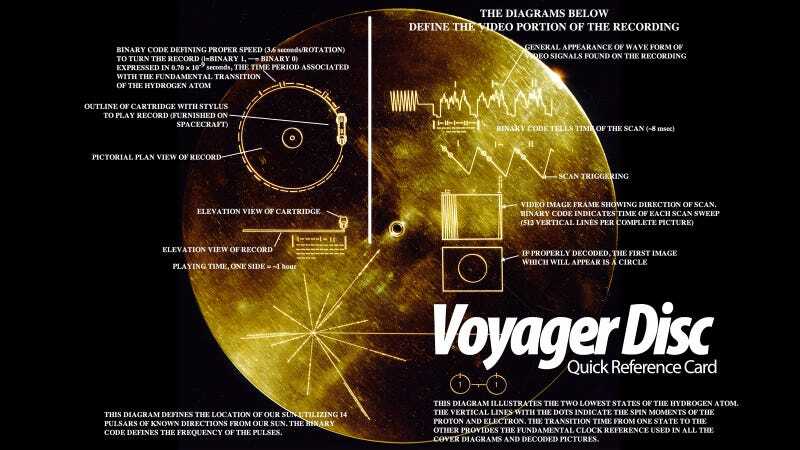 Who the Hell Can Understand the Voyager Disc's User Manual? In a very distant future an alien spaceship will come across one of the Voyager spacecrafts. And when they do, they will find two things: a golden disc—a space-proof metal version of a normal vinyl record containing sounds, music and images from Earth—and a record player. When that happens, we will subject the aliens to the same torture that gadget companies have been imposing on us for decades: a user manual. It's not hard to imagine that this reason alone will be enough to cause an interplanetary war. The spacecraft will be encountered and the record played only if there are advanced space-faring civilizations in interstellar space. But the launching of this 'bottle' into the cosmic 'ocean' says something very hopeful about life on this planet. Sagan also publicly said that "the record is best seen as a time capsule or a symbolic statement more than a serious attempt to communicate with extraterrestrial life" but, knowing his views on the matter, I can't help but think that he probably had some hope about it being found by someone. To that effect, a team started to curate a list of sounds, music pieces and images that would be the perfect representation of planet Earth. Or, at least a nice testimony of our understanding of it. They recorded all this data in analog form on one side of the disc. That was the only technology available at the time, when they launched in 1977. No MP3s or JPEGs or animated GIFs. On the other side of the disc they etched a quick reference card. I can't make any sense out of it, but obviously I'm neither an engineer nor an alien, despite what some of my wives have said. Never a greeting card was so gloomy as this one. The aliens will also get to hear music from Beethoven, Mozart, Bach and Stravinsky, along with Blind Willie Johnson and Chuck Berry. I'm quite happy to know that Berry will be rocking in the clean room of some Imperial Star Destroyer. Roll Over, Vader. They will also find the images in the second video. 116 images encoded in analogue form, composed of 512 vertical lines—a video signal that will play fine in any old TV set. The images were selected to give a good idea of our place in the universe, showing everything from the planets in our solar system to our internal body structure (always nice to show your guts to hungry aliens) and different scenes from Earth. Incredibly enough, among the images there weren't any pictures of a naked man or woman, showing us bare as species. Apparently, NASA told Sagan and his colleagues that they wanted to avoid the controversy of the Pioneer plaque, which was attacked by prude conservative groups in the United States—which I guess is a testimony of the sad state of things in this country at the time (and now). I didn't learn about that until today and I'm speechless that NASA conceded. It seems that some people were—and still are, I'm sure—afraid to show human penises and breasts to an alien civilization traveling in a spaceship. Think about that. Now that is reason enough to wipe out our planet. Or at least, abduct all those morons. Maybe that's what the rapture is all about. In any case, chances are that aliens will hear and see us way before someone crosses paths with this golden greeting card. Radio signals travel way faster than Voyager—at the speed of light—and in every direction. And we have been sending them for decades now. Even if the radio signals degrade after 50 light years, a passing starship flying a few light years away (or perhaps a listening outpost) would catch them sooner and easier than finding Voyager—which, in the immensity of space, it's the perfect example of the proverbial needle in a haystack.